Dr. Hrayr K. Shahinian is Director of the Skull Base Institute. 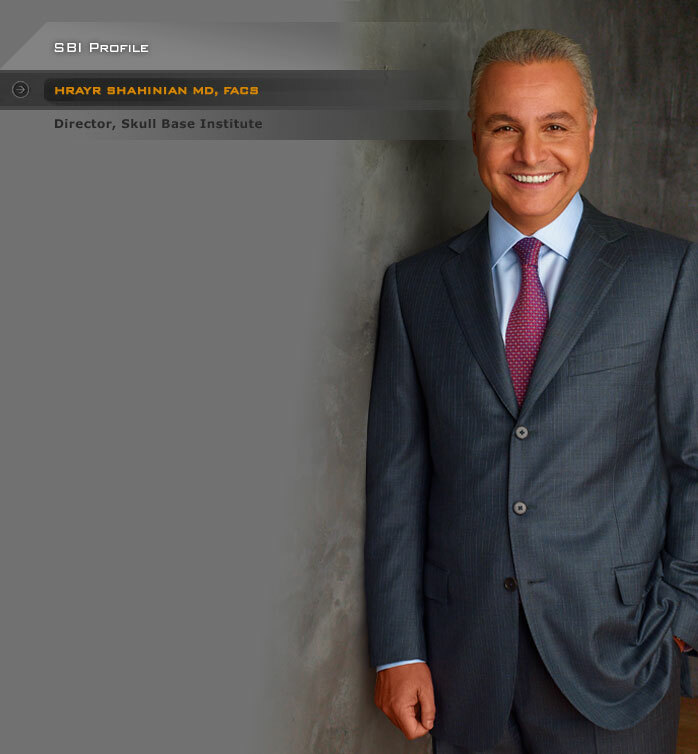 Prior to creating the Skull Base Institute on the West Coast in 1996, Dr. Shahinian served as Co-Director of the Skull Base Institute at the State University of New York at Stony Brook, and an Assistant Professor of Surgery and Neurosurgery. Dr. Shahinian earned his bachelor's degree in biology and chemistry, and his medical degree from the American University of Beirut both with distinction. He completed his clinical clerkships at the University of Chicago during the third and fourth years of medical school. He completed his surgical residency at Vanderbilt University Medical Center in Nashville, Tennessee and his plastic and reconstructive surgical residency at the Institute of Reconstructive Plastic Surgery at New York University Medical Center in New York, New York. He then completed two fellowships - the first in skull base surgery at the University of Zurich in Switzerland, and the second in craniofacial surgery at the Institute of Reconstructive Plastic Surgery at New York University Medical Center. He was on staff for several years at Cedars-Sinai Medical Center in Los Angeles, before going into private practice in 2003 and moving Skull Base Institute to its current location. He is Board Certified by the American Board of Surgery, certificate number 37731, and is a fellow of the American College of Surgeons.